At this point in the school year, we have had eight days cancelled due to snow or extreme weather. For two of those days, we were given a waiver by the state. Therefore, we need to make up six days. Below is a list of the dates that Goshen Schools will now use to make up these lost days. Goshen Community Schools will not longer be using the previously created Android and iOS apps. For mobile access, simply go the the homepage of the school using your phone’s browser and bookmark the site once it has loaded. All sites have now been optimized for mobile browsers and contain more information than the apps did. This will be a two hour delay from a regular school day schedule. The SAturday night “Night Out with the Redskins” and the Sunday NIVA youth volleyball tournament scheduled for Goshen HS have been cancelled. The music faculty recital at GHS on Sunday Jan 26 has been POSTPONED. Check back for a possible rescheduled date for the performance. On Friday night, Jan. 24, 2014, the Northern Lakes Conference will present Mr. Jim Kirkton with the NLC Service Award. In Jim’s 17 year career at GoshenHigh School, he held the positions of English teacher, assistant coach, assistant principal, and principal. Jim was a constant at all GHS home and away events and never hesitated to volunteer to work events to make them more efficient and positive for the student-athlete. In addition, Jim was long time head football coach at New Haven HS and accumulated over 100 coaching victories. Jim will be presented this award by NLC president and current GHS principal, Dr. Barry Younghans. The presentation will be made at halftime of the varsity boys’ basketball game between NorthWood HS and Goshen HS. How efficient is your car? Thirty Goshen High School students are working on developing a car that can reach 1,000 miles per gallon. The students are a part of the high school’s Super Mileage Club that builds small vehicles to be as efficient as possible. Of the 30 students who work on the cars during club and class time, 13 students and three instructors will be heading to Houston, Texas in April to test the efficiency of their vehicles against both high schools and colleges’ teams in the Shell Eco-Marathon. Students have competed in the national contest the past few years with cars in the gasoline prototype division. This year, the students are also converting a car to a diesel system. The largest challenge with that is fitting the significantly larger and heavier diesel engine into what’s supposed to be a light, compact vehicle. 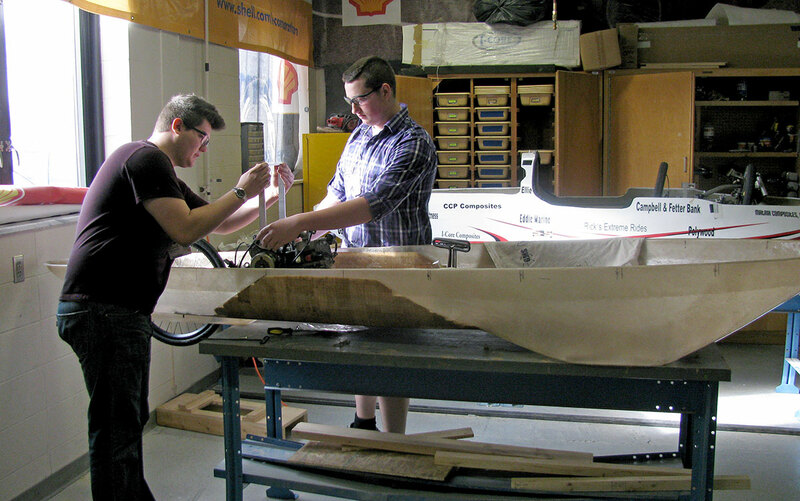 Cameron Gruntman, left, and Wesley Priem, right, work on one of the Super Mileage cars that they hope will reach 1,000 miles per gallon at the Shell Eco-Marathon in Houston, Texas, this April. The students don’t tinker with vehicles’ engines much, but focus on making the frame as light as possible and the entire car roll as easily as possible, said J.J. Johnson, a Goshen High School engineering technology teacher and the Super Mileage Club’s instructor. That means using as little metal as they can and continually trying for lighter designs. 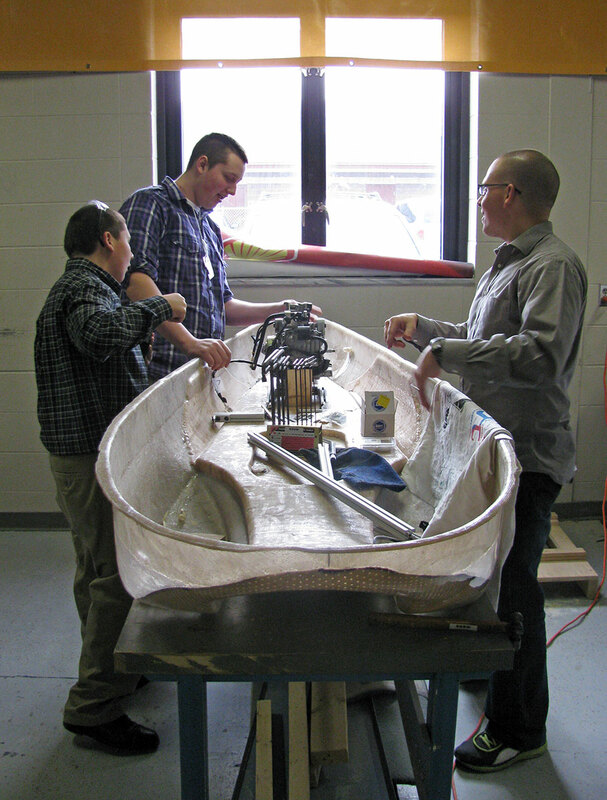 This year, the students are creating one car’s frame out of carbon fiber, which will be much lighter than the fiberglass they have worked with before. Students also 3D print many of the parts for their cars, which allows students to design and create pieces quickly and inexpensively. Wesley Priem, a senior at Goshen High School who is in his third year in the Super Mileage Club, said that he enjoys seeing the cars emerge through the design and build process. “I remember when that car was just a roll of fiberglass and a bunch of balsa, and then how it did at Houston,” said Wesley Priem, a senior at Goshen High School, while gesturing to one of the club’s vehicles. He knew nothing about construction when he joined, Priem said, but Johnson’s enthusiasm got him really excited about the Super Mileage projects. He’s picked up not only construction, design and engineering skills, but is a stronger speaker after learning how to approach local business people about sponsoring the teams. After graduating this spring, he hopes to pursue some major in the technology field. The club hopes to have a car reach 1,000 miles per gallon at the Shell Eco-Marathon in Houston this April. Last year, the car reached 535 miles per gallon. Students are also working at achieving a number of goals besides the actual building of the cars, including doing more publicity through Facebook and Twitter. The group also had a booth at the October First Fridays event in downtown Goshen and hopes to be at another later this year. The Super Mileage teams are still looking for sponsors, donations and other contributions to help cover expenses. One major cost for the club is getting both the students and the vehicles themselves to the Shell Eco-Marathon in Houston. Once the teams are there, though, Shell provides lodging and food. People can also stay up-to-date on how Goshen High School’s Super Mileage teams are doing through the club’s website, Facebook and Twitter pages. Goshen High School Principal Barry Younghans highlighted two GHS programs during the school board meeting Monday night, Jan. 12, that demonstrate how Goshen prepares students for college and a career. J.J. Johnson, an engineering technology teacher at the high school, explained to the board how a couple of the school’s students were featured in newspapers across the country for using a 3D printer to help a fellow student. The students developed and made a piece using a 3D printer that could be installed on the student’s gait trainer to keep her backpack from swinging and causing a bar to come down on her gait trainer and hit her legs. How students are using the 3D printers at school, though, goes beyond that, he said. “Last year,” when Johnson first brought 3D printers into the classroom, “the kids worked non-stop with them,” he said. He also introduced John Olafson and Steve Wygant of SeeMeCNC, a local company that produces 3D printers, thanking them for their involvement with GHS. Johnson said he often contacts them about how to do certain things. They said too that they also contact him about projects and ideas they have for 3D printers in the classroom. 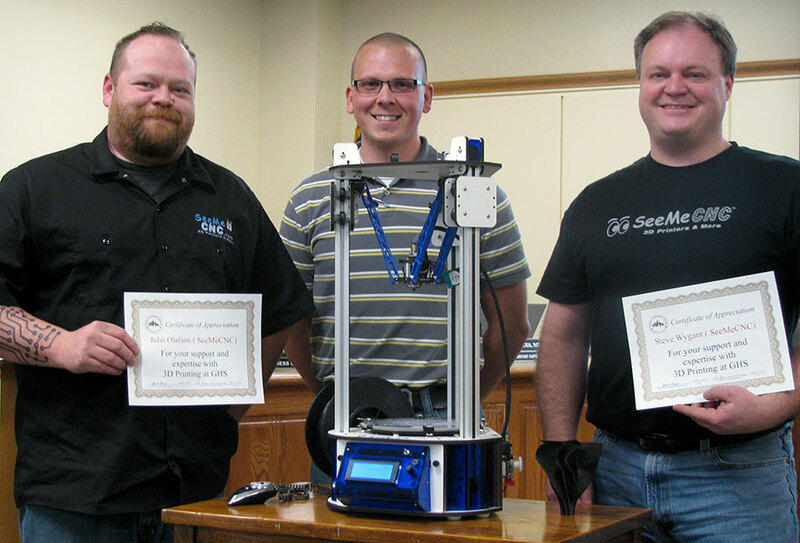 Johnson, the school board and administrators honored Olafson and Wygant for their 3D printing expertise and support of 3D printing at Goshen High School. Younghans also had the high school’s IB coordinator, Theresa Collins, speak about the International Baccalaureate (IB) program at GHS. Through IB, students can take individual IB courses or pursue a full IB diploma, earning up to a full year of college credit. The courses also instill higher-level thinking in students and, especially for students pursuing the full diploma, an emphasis on community service. Collins said that she continually hears about GHS IB graduates starting out at college as sophomores or IB students being more able to take on an intense schedule in school. The school’s IB program continues to grow. This year, Goshen High School will have 18 full IB diploma candidates and 182 students scheduled to take 365 individual IB subject exams. The class of 2015 has 29 full diploma candidates. “I’m happy to say I think IB is really thriving at Goshen High School,” Collins told the board. The Wrestling Invite at GHS on Saturday, 1/18. Matches begin at 9:00 AM. Admission is $7.00 for Kindergarten and up. Gates will open at 8:00 AM. Fans are encouraged to park in the west parking lot and enter by Door M or Door B. The doors around the gym will be closed besides for Goshen High School season ticket holders. Fans are reminded that no coolers or food may be brought in with them. Tournament brackets and complete results of the tournament will be available on line by visiting the Goshen High School wrestling page. 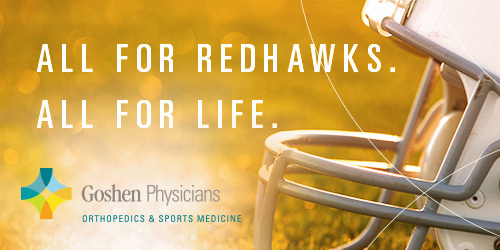 This can be accessed through the Goshen High School home page at ghs.goshenschools.org, Athletics, Wrestling. Please help in clearing snow from sidewalks. Your assistance is needed. We are still in need of sidewalks to be cleared for children walking to school or bus stops tomorrow morning. If you live in an area where students use the sidewalks, please be sure these are clear for tomorrow morning. We thank you for your support in getting our students to school safely! One of the main reasons school needed to be closed for Wednesday was due to the large number of sidewalks that have not been cleared yet. We are encouraging people to work with friends and neighbors to clear sidewalks so that our students can get to school safely. If you live near a walk-zone or hub gathering area, please do what you can to get these clear for safe passage to school on Thursday. Thank you in advance for your assistance on this matter, it is greatly appreciated! For this week only, there will be no late start for the first school-day of the week. The start time for January 8 will be the regular start time for a Wednesday. If GCS has a 2 hour delay, it will be a 2 hour delay from a regular Wednesday start time.